For canal preparation, JS Dental line of endodontic instruments has a superior cutting efficiency, flexibility and durability. Contoured hourglass handle for slip-free tactile control, with identification numbers on handle. All instruments are color coded to ISO/ADA specifications and can be sterilized by all methods. Contoured plastic handle for comfort and control. Packaged in box of 6. Fast cutting instrument with one continuous flute for fast removal of debris. Instrument designed for smooth preparation of canal walls. 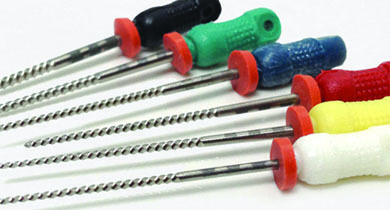 K-File instruments with a rubber stop and millimeter markings for easy adjustment of working length. Hedstrom instruments with a rubber stop and millimeter markings for easy adjustment of working length. Reamer instruments with a rubber stop and millimeter markings for easy adjustment of working length. 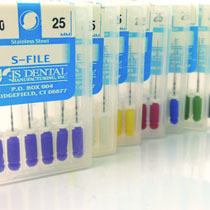 The S-FILE is the endodontic instrument with the perfect blend of flexibility, durability and cutting ability. 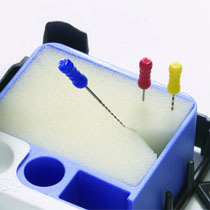 This unique instrument can be used with any hand motion to provide increased clinical safety and enhance tactile control of all canal preparation procedures. A combination between a K-File and H-File. This is an effective and stable instrument with two continuous flutes for fast removal of debris. ISO Color-coded plastic handle. Smooth conical shape with flat tip. Designed for both vertical and lateral compacting of gutta-percha and other filling materials. ISO Color-coded plastic handle. Smooth conical shape with pointed tip. Designed for compacting gutta-percha and other filling materials. Color-coded plastic handle. Designed for fast removal of pulpal tissue. Path finding instruments in S-File configuration. Path finding instruments in K-File type. R/A Engine driven H-File. Use in 1/4 turn hand-piece ONLY. The S-FILE is the endodontic instrument with the perfect blend of flexibility, durability and cutting ability. R/A Engine driven S-File. Use in 1/4 turn hand-piece ONLY. R/A Engine driven T-File. Use in 1/4 turn hand-piece only. MM markings & Rubber Stops. R/A Engine driven. Use in 1/4 turn hand-piece ONLY. High Quality Swiss made instrument. Designed for enlarging the coronal portion of the tooth. Metal R/A Handle, ISo color coded. 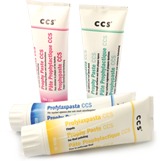 Designed for delivering root canal sealers and cements. Packaged in box of 4. Safety spring for extra flexibility.